Gorgeous looking, variety of tastes to suit almost anyone (even people without a sweet tooth such as myself), and while exepensive (14 Euro for 6 pieces), their taste is worth it. Worth recommending to try at the very least, if not as a lovely gift for your family. One cannot simply visit Paris without stopping at one of the few Ladurée stores littered in different corners of the city. Most famous for their Macarons, Ladurée has become associated with one of the best Macarons in the world - and it's the only place I've ever had a Macaron which I've actually enjoyed. I was first introduced to Ladurée 5 or 6 years ago during a trip with friends around Europe, when some of the girls we were with insisted we stop by this.. frankly quite pretty looking desserts store. Not knowing anything about this brand, I grudgingly walked in. Keeping in mind I do not have a sweet tooth at all, more so I've never been fond of Macarons. However, when I took a bite of a Ladurée macaron, I was instantly in love with this delicious 'sweet' cookie like this, and I've never really liked any other Macaron since. Of course, they've not been an overnight success - their fame comes from their taste as well as their history - having started in 1853, they're 153 years old, and have built quite the reputation. People queue up from all over the world to get a taste of their delicious goodness. However, they also are a restaurant where you can sit down and have a proper (slightly pricey) meal. 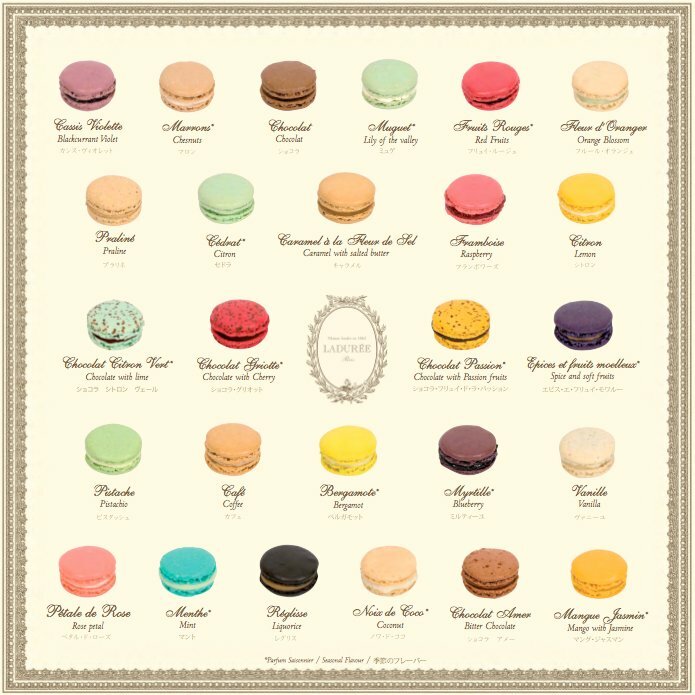 In fact, their entire menu (including Macarons) are quite pricey - but that doesn't stop people from taking multiple boxes home for their families overseas. I stopped by the Champs Elysees store, one of their most popular stores in Paris, to grab some Macarons on the way to meet a friend. I was welcomed by a young American woman who was very helpful in choices - of which there were many - and I decided to stump for only 6 macarons, being as they are quite pricey and I didn't know which flavors I would enjoy. Here's a sample Menu below (credit to Bragmybag). Anyways, to give you an idea of the place - they keep a very chic French decor inside, with dim lights, but they keep their pastries and macarons nicely lit of to give a glowing effect. My camera wasn't having the best of luck capturing this due to the low light issue, but I found one on their website below to give you a better idea of just how pretty everything looks inside. Nevertheless, I grabbed my 6 macarons and rushed out the door to meet a friend. As I was flying out the next morning, I decided to get back home (Delhi) before eating them as they tend to stay fresh for a few days if they keep cool. However, I couldn't risk not taking a picture in the pretty little boxes they give them in, as they look quite gloriously delicious. I did obviously sneak a bite of one in the hotel, as I was curious to see the taste and honestly it took a lot of willpower to not just demolish the entire box there and then - but I resisted so I could enjoy it at home. Overall it cost be 19 Euro for 6 Macarons and a lemon cake slice (which was meh at best), but the macarons were truly delicious, despite the cost. Over the coming days I had one Macaron a night to get used to them, and most were delicious, except the Blackcurrant, which tasted odd, and the sugary topped 'Red Fruits' Macaron which was a little too sweet, even though it was one of the nicer looking ones. The other flavors - Vanilla, Lemon, Blueberry & Rose Petal Macarons were quite delicious and worked well as a light dessert. The texture was smooth, with a hint of crunchiness when baked, and the filling wasn't particularly over the top sweet, so it hit the spot just right. As you can see, it's quite a delicious looking thing. Wrapping up - while expensive, Ladurée has one of the best Macarons you can find anywhere. While some people might feel they are over-hyped, they certainly have a way with making them, and I truly enjoy stopping and grabbing a few everytime I pass through Paris.